Irish rock band U2 were honoured today as the greatest act of the past quarter of a century. The band were chosen by readers of music magazine Q as the top artists of the past 25 years at its annual awards. Chart-topping act Adele was a double winner at the event, landing the prizes for best female and best track for her hit Rolling In The Deep. The record-breaking singer's win comes just a fortnight after she was forced to pull the plug on a US tour due to problems with her throat which had threatened to wreck her voice irreparably. Other big winners included Coldplay, who were named the best act in the world today, and Take That's Gary Barlow, who was rewarded with an honorary prize as classic songwriter for his two decades of hits. 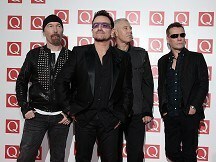 U2's award was a special prize to mark Q's 25th anniversary this year. The band are currently promoting a reissue of their "rebirth" album Achtung Baby, to mark 20 years since its release. The best album prize went to Bon Iver - the pseudonym of US singer-songwriter Justin Vernon - for his self-titled second release, while Brit-winning star Tinie Tempah continued his run of success by taking the best male award. Former Oasis guitarist Noel Gallagher - currently number one in the album chart with his solo debut - was named Q Icon. And pioneering punk star Siouxsie Sioux was rewarded for her outstanding contribution to music. The awards at London's Grosvenor House Hotel also saw rock legends Queen given the hall of fame award, in a year which marks the band's 40th anniversary. Singer Jessie J landed the best video title for her Do It Like A Dude single, but she missed out on the breakthrough prize, which went to Ed Sheeran. X Factor judge star Gary Barlow is to perform a pair of solo headlining shows - his first for more than a decade. X Factor fan Noel Gallagher declared that the show has been "no good" since the departure of Simon Cowell. A man has appeared in court to deny charges linked to an alleged plot to kidnap and kill soul star Joss Stone. The Feeling and Pete Townshend are among the rock stars who will team up with young aspiring artists for an upcoming charity gala in London.